I love working with brown willow (bark on) when making baskets so they have a rather rustic appearance and texture. Different varieties of willow can be used to give some contrast in colour. Depending on your ability you may be able to add a handle. This workshop is suitable for beginners and those returning to make even better baskets and to learn new techniques. This basket can be made on a full day workshop, a 4 week course on a Tuesday morning for Frome Community Education or at an evening class. This 'berry basket' is a version of a very old design, in fact it is considered to be one of the earliest forms of basket ever made. 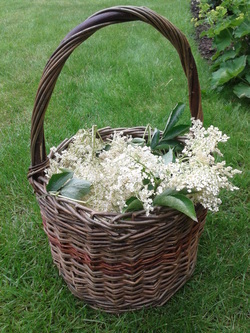 The basket is perfect for foraging as it is light enough to carry easily and deep enough to hold a good quantity of plants etc. These baskets are strong and will continue to be useful for years to come. Slight variations of the design and shape can be achieved. This basket can be made on a full day workshop, a 4 week course on a Tuesday morning for Frome Community Education or at an evening class. This log basket can be made with a round or oval base. 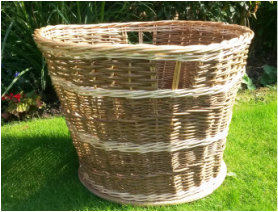 The size and style of the main basket can be varied to your specifications, the handles are set within the weave at the top of the basket. This basket can be made on a full day workshop, a 4 week course on a Tuesday morning for Frome Community Education or at an evening class. On this course you will make an oval shopper with a handle. Different varieties of willow will be used to give some contrast in colour and texture. The technique used is more challenging than a round basket therefore it is a requirement that you have made at least one basket before. This basket can be made on a full day workshop, a 4 week course on a Tuesday morning for Frome Community Education or at an evening class. This lovely tray basket is great for serving bread etc. The style of border would depend on your ability but would look equally as beautiful! This basket could be made on part of a 4 week course on a Tuesday morning for Frome Community Education or at an evening class. This framed platter is very useful for all sorts of things and has the advantage of not taking so long to make as a full basket! Depending on your ability and therefore the time available you may be able to add a handle. Slight variations of the design can be achieved. This could be made on part of a 4 week course on a Tuesday morning for Frome Community Education or at an evening class. This is a simpler version of a willow platter, equally as useful. It is suitable for large groups. If you are interested in this idea please contact me so we can discuss your requirements.